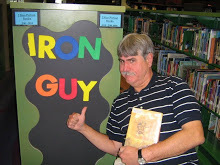 Hey Guys, the Iron Guy is back after his stomach-expansion workout last week. I certainly hope you all had a good Thanksgiving and are enjoying the holiday season now. As always, I've been on the lookout for good reads for guys and have found a couple of great ones. The first is Star Wars: The Adventures of Luke Skywalker, Jedi Knight by Tony DiTerlizzi with illustrations by Ralph McQuarrie. This one is really great. We all know the story but it's still moving, especially when you read all of Luke's story in one sitting. 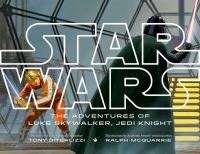 Tony DiTerlizzi (you may know him from the Spiderwick or Wondla books) does a good job summarizing the original Star Wars trilogy but what makes this book truly terrific is the magnificent, jaw-dropping artwork by the legendary Ralph McQuarrie. He was the conceptual artist for Star Wars--in other words, he was the artist who talked with George Lucas to come up with the look for the movies. This book gathers those paintings and puts them together to tell this terrific tale. This is a terrific book for ALL guys. If you're a Star Wars fan or even if you're not, this is one book you've gotta read! The story is exciting and the artwork is amazing. What more could you want? And if you are a fan, it will be fun to look at these paintings and see how they differ from the movies. (C3PO looks way different, for example!) PS--this book is in the picture book area of your local library but don't be embarrassed to go there and get it. It's truly a book for MANLY MEN like us! first boy who writes a review to the blog. You don't even have to review this book; just review any book--fiction, nonfiction, biography or graphic novel. I'll post your review on this blog and give you the book. You can come to the Myers Park library to pick it up but if you live too far away, I'll find a way to get it to you. All right, guys, it's the season of giving and I'd love to give this away! All the instructions on how to write a review are on the left-hand side of the page under "Here's How Our Blog Works," but if you don't understand something or have any questions, contact me at the Myers Park library.